Birth Of The Ramco Cements Limited : In the 1950s, investment in Cement Industry was not attractive due to price controls and the massive investments required. Only those entrepreneurs who were not profit-minded but cared for the country's development came forward to invest in the Cement Industry. When Shri. Manubai Shah, Central Minister for Industries in late fifties came to Madras to meet the Industrialists, he called upon Shri P A C Ramasamy Raja and requested him to start a cement factory in TN. This was readily accepted by Shri PACR and this marked the birth of The Ramco Cements Limited in 1961. Concern for Investors: On the night of September 3, 1962, while the whole city slept, PAC Ramasamy Raja lay on his bed in the Madras General Hospital, seriously ill. As all his near and dear watched with tears in their eyes, PAC Ramasamy Raja summoned his son Ramasubrahmaneya Rajha to his bedside. "There is no more hope", he whispered, "You should take care of everything from now. My main concern is for The Ramco Cements Limited. I have taken a lot of money as shares from well-wishers and I have not paid them back any dividends as yet. This has to be taken care of immediately". Those were his last words. PACR's Dream Come True: PACR's last wish was dutifully fulfilled by the former Chairman Shri.P.R.Ramasubrahmaneya Rajah. Today, The Ramco Cements Limited is not only one of the most respected cement companies in the country but also leads in giving the best return to the investors. With a cement capacity of 15.5 millions tons per annum, the company is the fifth largest producer of cement in India. It is also one of the largest wind energy producers in the country with a capacity of 125.95 MW. 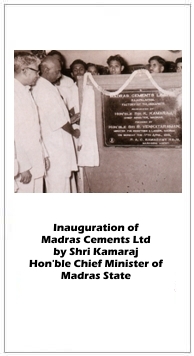 Birth of Cement Plants: The first plant of RCL at Ramasamy Raja Nagar, near Virudhunagar in Tamil Nadu, commenced its production in 1962 with a capacity of 200 tonnes, using wet process. In 70s, the plant switched over to more efficient dry process. A second kiln was also added to bring the total capacity to 15 lakh tons per annum. The second venture of RCL is its Jayanthipuram plant near Vijayawada in A.P., set up in 1987. The 36.50 lakh ton per annum plant employs the latest state-of-the-art technology. The third venture of RCL is at Alathiyur in TN. It was set up in 1997 and expanded by addition of another line in 2001. The 30.50 lakh tons per annum plant is the most modern plant in the country. Ariyalur plant started operations in 2009 with a capacity of 2 MTPA. It is well-equipped with modern quality control systems.Currently Line 2 of the plant with a capacity of another 2 MTPA was commissioned in 2012. Other Ventures: In 2000, RCL acquired Gokul Cements situated in Mathod in Karnataka whose capacity is 2.90 lakh tons per annum. Being an eco-friendly company, RCL set up the Ramco Windfarm in 1993 at Muppandal in TN. This was followed by wind farms in Poolavadi near Coimbatore in 1995, Oothumalai in 2005 and in Mathod - the combined capacity of the wind farms is about 125.95 MW. In the year 1999, RCL commissioned the most sophisticated Ready Mix Concrete Plant in Medavakkam in South Chennai. In 2002, a state-of-art Dry Mortar plant was commissioned near Sriperumpudur, Tamilnadu which manufactures dry mortar, cement based putty and tile fix compound. The Company has four satellite grinding units, located at Chengalpattu and Salem in Tamil Nadu, Kolaghat in West Bengal and Vizag in Andhra Pradesh. The aggregate grinding capacity of the four plants is 40 lac tonnes per annum.